Every year a huge number of medical mistakes injure and kill hospital patients. In many cases these errors are preventable. It is important to make the medical system safer and to increase the quality of the patient’s life during hospitalization. One of the most useful methods to analyze and prevent incidents reoccuring is the clinical audit, a meeting organized by a facilitator, who is a physician responsible for clinical risk. In this meeting he invites all the people (doctors, nurses, technical staff etc.) who treated the patient. The aim of the audit is to analyze the case and to find the causes of the mistakes, in order to avoid errors in the future. The analysis is a complicated process that can last more than two hours. The participants are often afraid that they will be held responsible so they become very defensive. This project aims to avoid errors in the future and to make people less defensive. Starting from a deep research into clinical risk, done with the support of the Clinical Risk Center of the Tuscan Health Authority, I built interactions that help people to collaborate and to encourage all the participants to share what they know without fear. Initial user tests comfirmed that the interaction is easy to understand. The graphics are vivid and intuitive in order to make the interaction intuitive and human. The whole interface is designed to be clear to the large target of users. 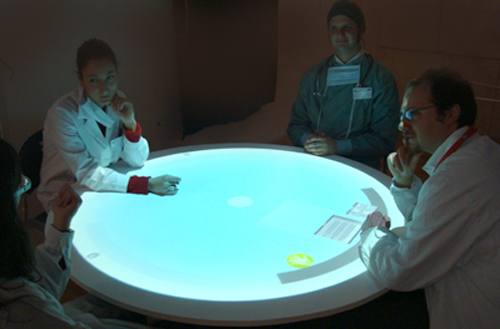 The table is circular in order to not to create distinctions between participants and to make them feel comfortable during the audit. It can take from 8 to 16 people. The facilitator has control of the meeting. He decides who speaks and which documents people need to consult so he sits always in the same place, recognizable by special controls. 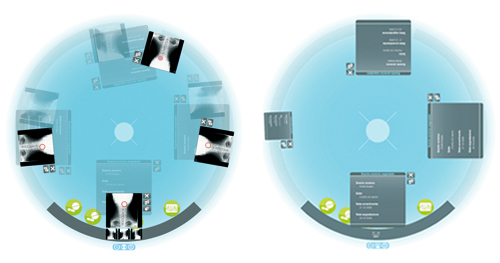 Tondo: an interactive table for medical errors by Valeria Donati on Vimeo.